I actually enjoy local elections. Always have. Campaigns for local office are, well, local. It’s about our street, our neighborhood, our city and schools. Local elections are about the stuff that’s closest to home; the stuff that affects us the most. Here, at East of Allen, we’re all about being local. This blog started three years ago and, from the beginning, has been focused on East Pasadena life and history. Local elections are an important part of East Pasadena life and the person we elect to City Council will significantly impact this part of town. So, at the risk of offending some, I’ve decided to weigh in on the runoff election. Choosing between the two candidates has not been easy. Last Fall, both called and asked for my support. I told them that I did not know who I would support and would not decide until late in the campaign. I did my homework. I read the candidate statements, visited their websites and read their mailers. Thanks to the wonders of the Internet, I watched the candidate forums. But, I was still undecided and asked to meet personally with the candidates. I told both in an email that I was considering making an endorsement on East of Allen. Jill Fosselman met with me and answered my questions. Gene Masuda refused to meet with me. In a later post, I’ll talk about which of the two candidates will get my vote and why. Early yesterday morning I was driving down Walnut Street and saw that someone had seeded the roadside with poppies. After the rains, the flowers are now in bloom and stretch along the road for hundreds of yards. The brilliant colors of the poppies stand out in this otherwise industrial gray part of town. To the right of the photo is the Avon shipping yard filled with big rigs. On the other side of the street are smaller businesses and the new Grandahl lumber yard. I think the strip of land is part of an old railroad right of way. Don't know who owns the land or who planted the flowers. But, whoever they are, they definitely deserve a "caught being nice" award. Thank you to whoever you are. We're nearing the end of March and it looks like the sun is on its way. Forecast is for 87 degrees by Thursday. 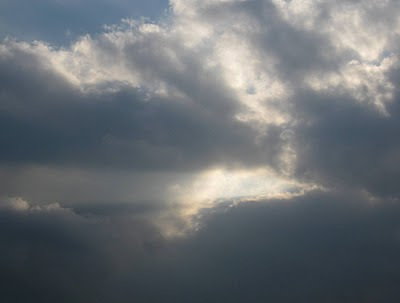 The sun seems right on schedule. In average years we get 4 to 5 inches of rain a month from January through March. Then, we get around an inch in April before easing into the long dry season. I like this time of year. The hills and mountains are green. Fruit trees are in bloom and bees are buzzing. Seems like everything is growing. Even the weeds. Which reminds me to that we need to get out and finish preparing an area for our spring garden. East Pasadena votes today for the person who will represent us on city council the next four years. Even in a down economy, development pressures and neighborhood protection are key issues. One issue on the immediate horizon is reuse or development of the historic St. Luke's Hospital site (pictured above). Other East Pasadena issues are lying in wait -- issues like the use of the empty car lots on Colorado, the vacant Hastings Theater, development near the Sierra Madre Villa metro station, and the seemingly forever stalled plans for an Eaton Wash trail. Then there are now perennial Pasadena city issues like the budget, city employee compensation, crime, housing, and the public schools. Four candidates have each staked out different ground and run serious campaigns. Based on the relative parity in candidate lawn signs, chances are no candidate will win a majority and there will be a run-off. If there is run-off, we will hopefully see the candidates get more specific on the issues. We'll see how it all shakes out. The election (or is it re-election?) 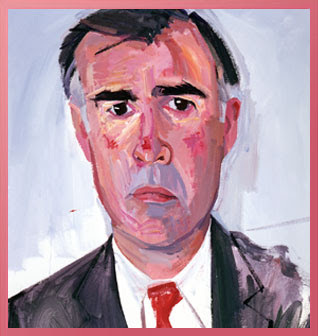 of Jerry Brown as governor has me thinking about the Governors' Gallery, which is the gallery of portraits of the 40-odd California Governors. The Gallery lines the halls of the Capitol Building in Sacramento. It is also viewable online. Thoughts of the Governors' Gallery, of course, make me think of East Pasadena pioneer William Cogswell. We start with the official state portrait of Governor Jerry Brown -- far and away the most unusual and controversial portrait in the Governors' Gallery. Painted following Brown's eight year term ('75-'83), the portrait captures the then-young governor and probably also the reflective but anxious mood of the times. Actually, you could read a lot into this portrait. But, one thing is for sure, the portrait is wildly different from any other portrait that hangs in the dignified halls of the Capitol Building. As you might guess, the interior of the Capitol Building is a regal blend of marble, dark woods and deep colors. The distinctiveness of the Brown portrait fairly well screams out from the otherwise subdued Capitol hallways. So, here's the East Pasadena connection. The Haight and Low portraits were painted by East Pasadena pioneer and famous artist, William Cogswell. In fact, Cogswell painted the portraits of many early California Governors. Seems that in the early days of statehood, no one thought to commission Governors' portraits. That oversight was corrected in 1879 when the State Legislature selected Cogswell to paint the portraits of many former governors. Cogswell was by then a California resident. In 1873 he had purchased land east of Eaton Wash and north of present day Foothill Blvd. where he co-founded the Sierra Madre Villa Hotel. In all, Cogswell painted nine Governors' portraits. So, as you walk the Capitol hallways, about one quarter of the portraits in the Governors' Gallery were painted by East Pasadena pioneer William Cogswell. The Governors' Gallery is not the only place in the Capitol where you'll find Cogswell's work. Cogswell was most noted for his portrait of President Abraham Linicoln. Begun during Lincoln's presidency and finished posthumously, the portrait was selected as the official White House portrait of President Lincoln. Over the years, the enterprising Cogswell was also known to paint a few replicas of his famous Lincoln portrait. Though now mysteriously missing, one of Cogswell's Lincolns hung in Pasadena's public library. Another of his Lincoln portraits found its way into the Capitol Building. Since 1909, Cogswell's portrait of Abraham Lincoln has hung over the California State Assembly Chamber behind the Speaker's podium. For more on Don Bachardy, who painted the Jerry Brown portrait, check out The Greatest Story Ever Told at Pasadena Adjacent. .